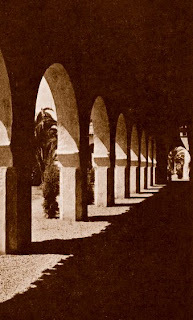 To create the appearance of an actual Tunisian city, architect Hugh R. Davies designed the exterior walls of the Pacific Southwest Exposition as plain and unadorned. The feel of crossing a barren desert was simulated by placing a vast unpaved parking-lot at the end of Seventh Street, on the east side of the exposition grounds. At the west side of the parking lot was located a long white unadorned facade, forming the outer wall of the the exposition palaces. 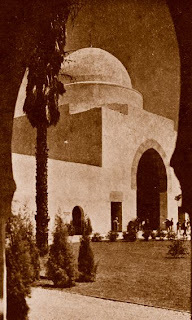 At the center of this wall was placed the main entrance to the exposition, consisting of a large square pavilion containing a Moorish-style arch, and topped with a massive chalk-white dome. At each end of the outer wall was located a smaller domed pavilion, marking the corners of the exhibit palaces. After passing through the turnstiles, located within the domed entrance pavilion, a lushly landscaped garden-court suddenly appeared. This gravel-paved court contained spacious lawns, planted with shrubs, flowers, and several large palms. Surrounding the court, on three sides, was a long Moorish-style arcade roofed with mission-tile. At two corners of the arcade were located octagon-shaped towers, topped with small latticed minarets. 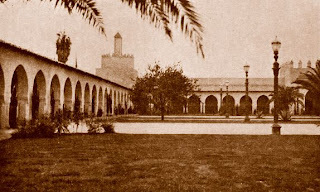 On the south side of the court a large square pavilion, with a Moorish-style arch, formed a gateway leading to the Avenue of Nations; while a similar pavilion and arch, on the court's north side, opened into the Palace of Education & Liberal Arts. On the east side of the court, on either side of the main entrance, were located the exposition's administrative offices, a large banquet hall, and a cafeteria.